Yesterday was one of those autumn days when golds, reds and greens become dazzling against a bright sky. Glencoyne Woodland was dreamy – sunlight making the canopies of ash, oak and sycamore leaves a play of translucent colour. Once again the weather forecast was spot on, and our choice of day to hang the orange cloths in the wood turned out to be perfect. It has taken several journeys along this path to the pine over the last year, in all weathers, and much time sitting with many trees along the way, to come up with the short haiku-style verse that the trees would spell out. The process feels as if it has been a collaboration between the trees and our response to them. There were so many trees that stood out for us but we narrowed it down to seven, choosing those that were the highlights of this very special woodland. 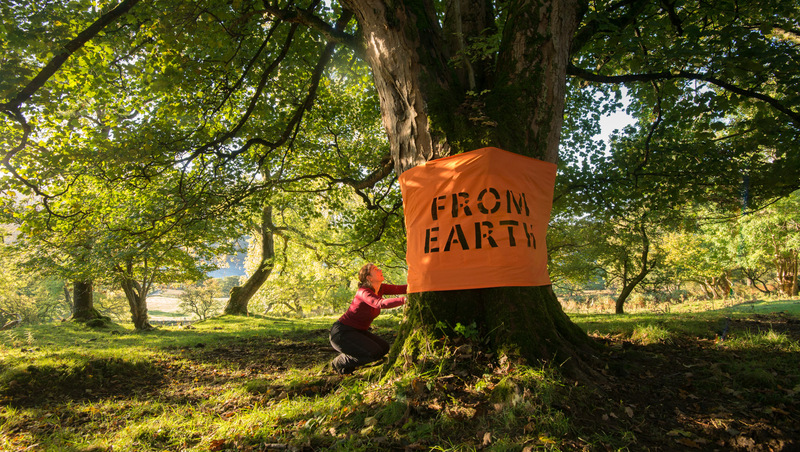 Once we knew which trees we were going to use, and knew their shape and feel, I felt able to compose the haiku – a verse that would work as a whole, but also in the sections that would appear on the trees. 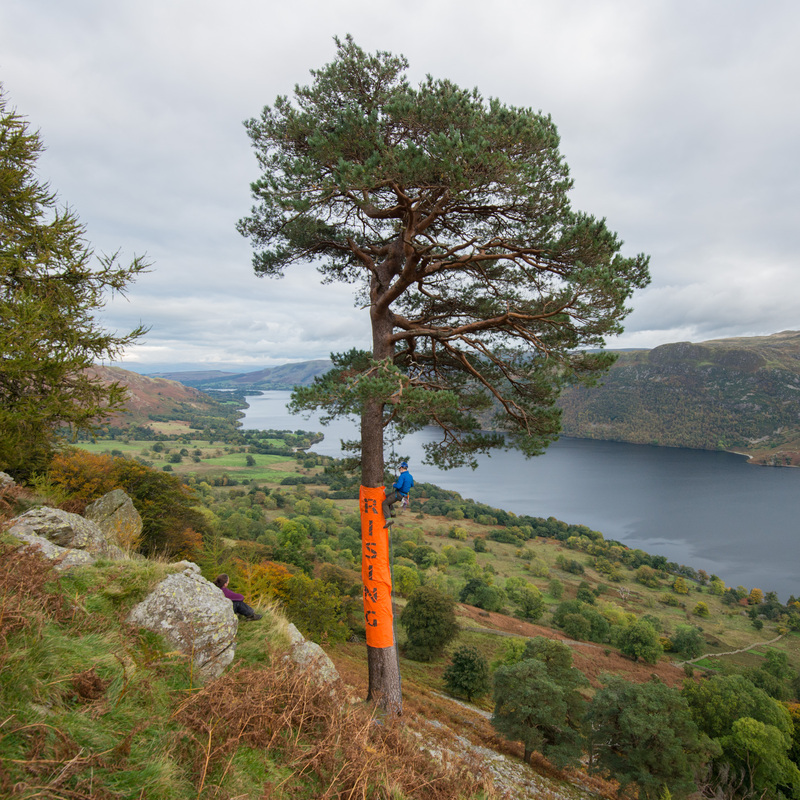 We chose: sycamore, oak, hawthorn, alder, ash and beech with the final tree the Glencoyne Pine. 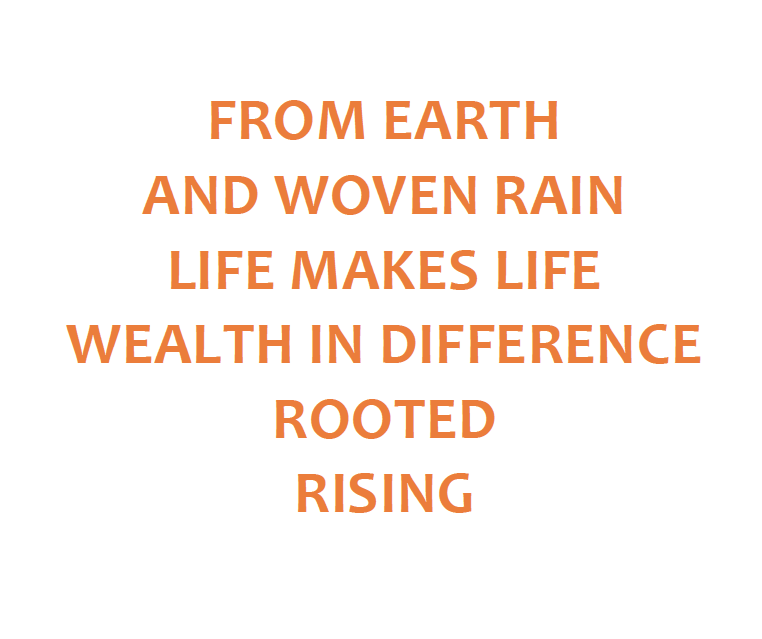 The words that emerged did not conform to the very rigid interpretation of a haiku being a set of three lines with syllables in a 5-7-5 format. But this ‘rule’ is not rigidly adhered to – either in English or in Japanese, the language of original haiku poetry. Indeed the ‘father’ of Haiku, Basho, varied his own verses away from this rigid form. We have gone to this particular pine again and again, for more than a year, in all weathers, and sat with it, and other trees along the way, many times. The addition of words to the trees, just for a short time, explores a different type of ‘page’. For us, it allows the combined expression of tree and word, and when we stood and looked at the wrapped trees we felt an invitation to slow down, and an opportunity each time to build our own relationship with these trees. Not sure how it will be for others who encounter these words in the woods, but we hope some people will let us know their response. 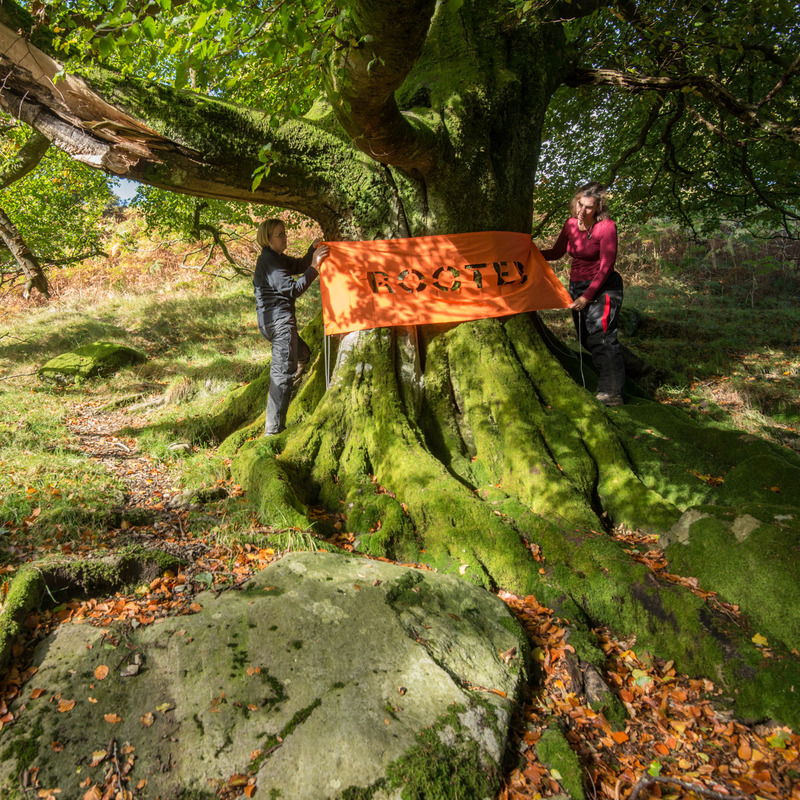 After many, many hours preparing the pieces of orange cloth, hanging them onto the trees was relatively simple and quick, and it was good to have some help along the way – thank you Cath and Dave for helping us tie the strings and make sure the words were as straight as the trees allowed them to be. The last and largest word, RISING, however, which takes up four metres of cloth, was not quite so straightforward. Attaching that to the Pine took expertise in climbing that Rob and I don’t have, and we’re hugely grateful to Martin for having the nerve and the skill to get up there (he made it look so easy). After writing the haiku I wrote a longer poem to contain it: one within the other, as the trees are part of the wood. Want to go and see the trees? The installation will be in place until October 30th. The trail begins across the road from Park Brow Car Park, GR 398205 just above Aira Force. It’s a public footpath, passing through farmland. Please stick to the path, and if you’re walking with a dog, keep it under close control. The path is seldom trodden, and is muddy and wet in places, with narrow sections and some stream crossings, so please make sure you’re well equipped. The walk takes between 1 and 1.5 hours, with a gradual ascent from the road at 220m to the Glencoyne Pine at 420m. 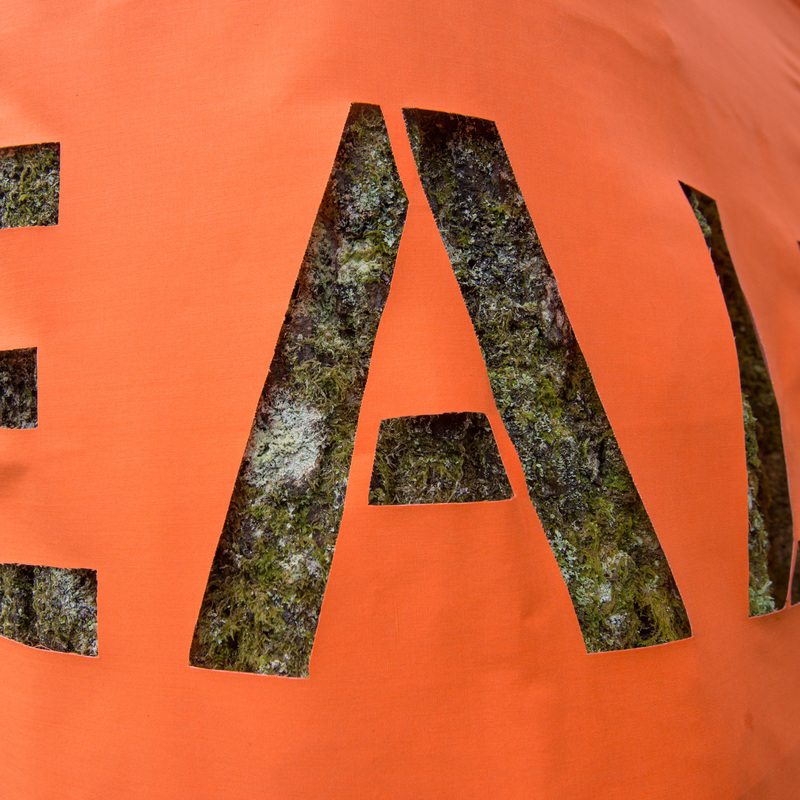 The path is marked at intervals with orange cloth. The pine tree is beyond the beech woods. The tree emerges from a steep section of land below a grassy outcrop. We have marked the way to this outcrop. Please do not attempt to go down to the tree, for your own safety and to protect the fragile environment. The tree is best viewed from the outcrop where the path ends. On the way back, it’s downhill all the way! Placing the cloth on the oak. 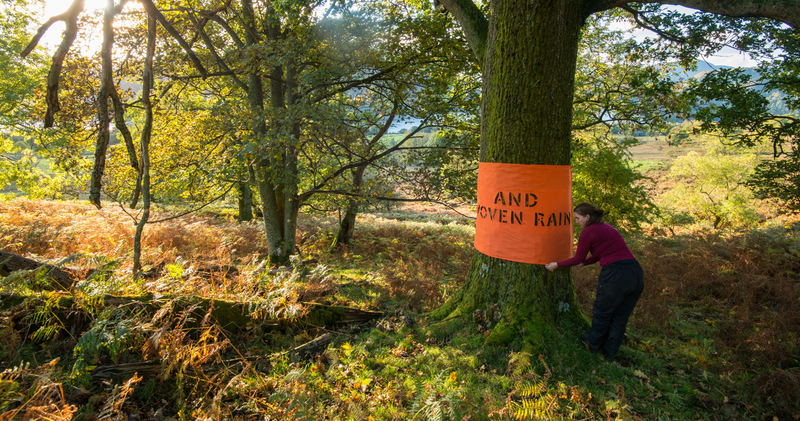 For more about the process of this installation, and the significance of the colour orange, see the earlier blog Orange: A Haiku in the Trees. For more on the woodland of Glencoyne Park, with insights from Cath Marsh of Natural England, read the blog Wealth in Difference. Japanese poet and teacher Matsuo Basho, 1644 – 1694, was a revered poet during his lifetime, famous for his short ‘hokku’ or ‘haiku’ verses, and for the practice of linking them as ‘renga’. He is recognised as the master of Haiku. If you’d like to read more about and by Basho, try The Narrow Road to the Deep North (there are several translations and commentaries) or On Love and Barley – Haiku of Basho (translated from the Japanese by Lucien Stryk, Penguin, 1985).